With all three gold fleets getting 3 or 4 races in before noon, the fleets returned to shore in anticipation. They’d soon be notified of their scores, with the top ten teams suiting back up for their final, double-points Medal Race. 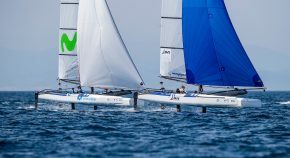 With 2017 European Champs Ruggero Tita and Catarina Banti winning 6 of the 7 Gold Fleet races, the medal race was mostly a formality. Mathematically the Italian pair could still fall out of contention – however unlikely – and indeed Tita and Banti saved their worst race for last. 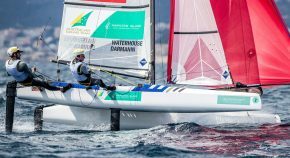 They started late, on port tack, while Rio Silver Medalists Waterhouse/Darmanin (AUS) charged off on foils to the left corner of the race course and a big lead. With barely 5 minutes on each leg of the short Medal Race, Tita/Banti never found the chance to claw back positions, though they didn’t need to: Despite a 7th place and 14 points on the board, Tita/Banti became the first repeat European Champions in the foiling Nacra 17. The Aussies would have a typically strong performance in the moderate winds while British Sailing Teammates Saxton/Boniface and Gimson/Burnet – both ahead of the Aussies – fought each other around the short course. Genuises in the breeze, Waterhouse/Darmanin continued to extend their lead, and their bullet, combined with average finishes from the duelling English teams allowed them to jump both UK teams.to take 5th for the event. Top female helm Gemma Jones and crew Jason Saunders finished just ahead of Tita/Banti while keeping a charging Fernando Echavarri/Tara Pacheco behind; they would hold on to the second podium place and earn their silver medal with a strong and consistent week, and just 3 races all week outside the top ten.. All week long Echavarri/Pacheco were smoking in the light air, but when the breeze came on they found it hard to hang with the leaders – a problem Echavarri said he and Tara “are working hard to fix” before next month’s World Championship in Aarhus, Denmark. While the flying catamarans were relatively drama free today with the podium mostly decided before the final race, no lead was safe in the 49er and FX fleets, with both classes’ overnight leaders losing big, and nearly every team having at least one deep finish during the morning’s three races. At last year’s European Championship in Kiel, Germany’s Vicky Jurczok and Anika Lorenz led for much of the week, losing their lead and dropping to third on the final day as countrymen Tina Lutz and Susann Beucke became the first FX European Champion in German sailing history, and Jurczok/Lorenz were clearly out for redemption today. They were the only gold fleet boat without a double-digit finish in the morning races, moving into fifth just before the medal race. And when the gun sounded for that all-important match, the Germans had to hope their competitors made an error – and many of them did. 4th place Steph Roble and Maggie Shea (USA) – both champion match racers – set their sights on 2nd place Sophie Weguelin and Sophie Ainsworth (GBR), sailing them back into the fleet while Jurczok/Lorenz were free to work the strong left side of the beat and streak off into the distance. The Sophies suffered behind the Americans and were unable to break cover, though their 7th place finish – one behind Roble/Shea – was enough to hold onto the final podium position. The Germans finished tied with the Sophies, taking the Silver spot on the tie-break. Norway’s Helene Naess and Marie Roningen sailed conservatively and cleanly to a proud second place and their first European Championship title by an incredible 22 points. In the stiffer breeze, lightweight surprise overnight leaders Carla and Marta Munte (ESP) were unable to complete their ‘Cinderalla story’ week, dropping to sixth after a last-place showing in the Medal Race. They easily won the medal for top Youth team, and despite minor disappointment, the Spaniards were overjoyed. “Our goal coming into Europeans was to make the Medal Race, and we did much better than that, and we really could not be happier,” said Carla Munte. These fresh faces are definitely a team to watch over the near future. For the Men’s 49er fleet, almost the entire 49er regatta was up for grabs on the final day. With only a single gold fleet race possible over the previous two days, a huge number of points were on the table for the final four races held this morning. Veterans Lukasz Przybytek and Pawel Kolodzinski (POL) used local knowledge and an overall solid game to pull into a narrow lead over a talented chasing pack on the final four-race morning. Polish teammates Dominik Buksak and Szymon Wierzbicki (POL) won the morning easily with two seconds, a ninth, and a drop pulling into third place. But with the points across the top 6 extremely tight, the medal race would decide the entire regatta. Sitting just outside the podium going into the medal race, reigning European and World Champs Dylan Fletcher and Stu Bithell knew exactly where they wanted to be. They easily won the pin end of the line and put the bow down hard to sail to the expected left shift. The shift materialized, and the British phenoms showed their championship heels to the fleet, building a huge lead before the final mark and sailing off to the finish. They did their part – would it be enough? Until the final race, leading Poles Przybytek/Kolodzinski (POL) sailed with amazing consistency. As the only boat in the entire 49er fleet without a double-digit finish going into the final day, they were the clear favorites – until disaster struck. Despite a terrible start and a few ugly tacks, Przybytek/Kolodzinski battled back, making up places as they closed down the first run. In a move of desperation, the Poles tried a little too hard to get inside Germany’s Justus Schmidt and Max Boehme, and the Polish boat collided with the Germans, snapping their carbon-fiber bowsprit and earning the Poles a disqualification from the on-water judges. A misjudgement of a few millimeters ended the Polish hopes for the Championship – and sent Przybytek/Kolodzinski back to 6th place! Their countrymen would benefit most from Przybytek/Kolodzinski’s misstep: No matter what happened anywhere else, Dominik Buksak and Szymon Wierzbicki knew they needed to finish fourth to be make the all-important podium. They were two places behind that at the final mark of the Championship, and Buksak said that’s when they came alive. “We sailed maybe the best run of our lives to finish fourth, and that gave us the silver medal,” said Buksak. 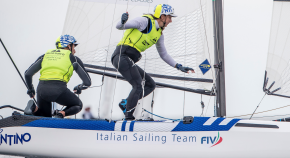 Spanish skiff stars Diego Botin and Iago Marra finished 3rd at the 2015 Europeans in their home nation of Spain. With 1st and 2nd place held by antipodeans, they found themselves in the strange situation of being “European Champions” without winning a regatta. While they were proud of their accomplishment then, they knew it wasn’t a ‘real’ victory, and as the warning signal sounded for the final race of the 2018 Championship, the Rio veterans knew they had a chance to redeem themselves. “We weren’t sure about the race, everything was so tight and we weren’t sure which side to play,” said Marra. “Fletcher was on our bow but we really liked the left side, and we held on to second for the top mark and then just sailed conservatively from there.” For the pair, this one means quite a bit more. “It’s another step up to become the open European Champion, and now our coach will finally stop making fun of us as “Third Place Champions,” joked Botin. 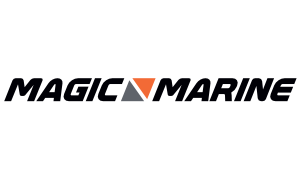 Botin and Marra will now focus on Aarhus, Denmark, the site of the 2018 World Championship and the first Official Qualifier for the 2020 Olympics “The most important thing right now is to qualify our country – nothing else really matters until that is finished,” said Botin. Few would bet against them right now.